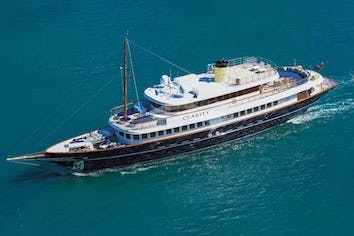 RELENTLESS represents one of the finest custom Trinity Tri­-Deck Motor Yachts ever built! Her custom traditional interior features mahogany joinery throughout. RELENTLESS features a five stateroom layout with an on­-deck king master suite along with four guest staterooms below, all with ensuite baths. Additional amenities include a tastefully designed main salon, formal dining salon with Murano crystal fixtures, a commercial galley, and an over-sized aft deck. Entering the main salon from the spacious main aft deck, you will notice a large, marble-­topped bar with four stools which faces the expansive teak planked aft deck. The formal dining room forward has an ornate buffet with lighted china cabinets and a pair of insets topped by gold leaf scallops. There is seating for ten around the glass topped dining table. The galley has a service entry with double French doors. The main galley is laid out in a T-­shape. The entry is off the starboard lobby with its inlaid Royal Oyster marble flooring and day head. Going forward is the spacious on-­deck, full beam master stateroom with a king size bed, private office/seating area, flat screen TV concealed with electric doors and a his and her marble bath with large shower and Jacuzzi tub. The lower guest accommodations are accessed from the foyer down the hand ­carved wooden spiral staircase. She features four well-appointed guest staterooms with two kings, one queen and a twin, all with entertainment systems and private marble bath. Up to the spacious skylounge with ample seating area,traditional wood desk, marble top bar and over-sized windows for panoramic views. There is also a marble foyer with day head and forward is the wheelhouse complete with electronics, port and starboard entry doors, wing stations, etc. To port aft is the Captain cabin with queen berth and private head. 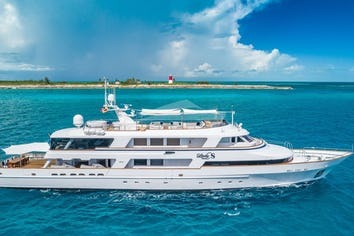 A spiral staircase from the aft deck leads up to the spacious sun deck which provides ample entertaining and sunning area. There is a large raised Jacuzzi spa forward with large sun pads on each side protected by a wraparound, tinted windscreen. 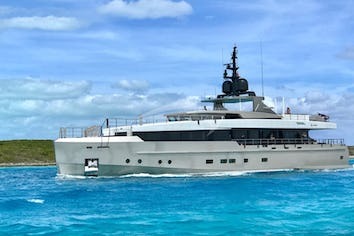 She features a bar tucked in the shade of the electronics arch and an air ­conditioned day head incorporated into the starboard arch structure. A canvas awning adds to the shaded area forward of the arch.